I'm posting from our rented RV camping in the middle of the desert at a place called Ocatillo Wells. Each year for the week in between Christmas and New Year we head out here with several other families to ride dirt bikes. Three of us happen to be youth pastors and we try really hard not to talk shop for the entire trip although I already ruined it by asking a programming question of one of my friends. Even though it's a riding the trip, that is only a small part of the fun. We spend a ton of time just sitting around doing nothing which is fantastic. We throw things, launch thing into the air, light things on fire.....all the usual stuff, which is always followed by me reminding my 10-year-old son how dangerous it is. Cole's highlight is when families toss their old christmas trees into the bon fire which makes a blazing inferno the likes of which he only sees once a year. As I sit here on my laptop (I'm not actually sitting on my laptop, but you know what I mean), my son is playing his Nintendo DS, and my daughter is listening to her Ipod and checking text messages. Not sure I can really call this camping. If you need a new year's lesson and want to save a bit of prep time over the Christmas holiday break, feel free to borrow from us. Below is our new year's lesson called "Bounce". The big idea is how to bounce back when you mess up. Pretty basic new year's lesson....nothing too deep here. When I MESS UP…will I BOUNCE BACK? Wanna Help Make A Catalog? Simply Junior High is creating it's first-ever print catalog and they need your help. They're looking for pictures of junior high ministry in action. If you have any fun pictures of students in your ministry we'd love the opportunity to put them in the catalog. Include the name and location of your church and a brief caption to go along with each pitcture. Also, by sending photos, you are confirming that you have received permission from parents for the images of the student to be included in print material. I was in our High School services all weekend, so really didn't get a flavor of how jr. high went. It was our second week of our 'unwrapped' Christmas series. Our lesson was 'What's So Merry About Christmas'. The highlight of the weekend was spending Sunday afternoon with my brother and his family and our dad. That was capped off by the discovery of an amazing Shave Ice place about 10 minutes from our house. I'm a lover of shave ice but could never get the real stuff (only the fake, crunchy kind...)until now. Look out sweet tea, there's a new vice in town! Now we get a short break: No youth services this weekend so families can attend our Christmas services together and then a jh/hs combo service on the weekend between Christmas and New Years which has become a fun tradition for us. Spent all day yesterday running various errands, Christmas shopping and beginning to get ready for our desert/dirt bike trip which begins the morning after Christmas. Actually, I find the comments at end of the article much more interesting than the article itself. I'm looking for somebody with some expertise: We are building a 'Skate Friendly' area in our new student zone (not a true skate park....) and our insurance company is requiring me to create a bunch of stuff that I really don't understand anything about. If anybody has a skate park at their church, or knows somebody who does, and would be willing to give me some insight I would greatly appreciate it! I've had a buddy since college who is the most encouraging person I've ever met. Every single time I talk to him, he finds a way to sneak in an edifying comment of some sort. I always walk away from my time with him feeling a little bit better about myself. I've been thinking lately about the power of encouragement. I wonder if anything has such a high return on such a simple investment. A few words of encouragement to a parent of a junior higher can make their day! Pointing out something you've seen in how the love their child or saying something kind to them about their kid are both super easy ways to encourage a mom or dad. A few words of encouragement to a 13 year old makes a huge difference. Look for something deeper than "I like your new hair cut" or "That's a cool skateboard" and point out something about his or her character. "I love the way you ________" or "I noticed the way you treated the new student" etc. take about 30 seconds but make a big impact. A few words of encouragement to your volunteers may keep them around a little while longer. Point out an area they excell in and thank them for it. Express ways your ministry is better because of them. Encourgement...I wonder if anything has such a high return on such a simple investment. Today is our Student Ministries team Christmas party. We are heading out to Moreno Valley (out towards the desert...) to race go-karts on a mile-long outdoor track. The Karts are supposed to reach speeds of 60 miles an hour which should be a ton of fun. They let you practice for a while and then set up actual races. We're a pretty competitive bunch so it should be interesting to see it all unfold! UPDATE: It's now 7:35 and I just walked through my front door. In a word: AMAZING. a few highlights. 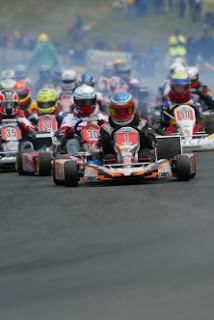 - The track was unbelievable...the largest go kart track in the U.S. at one mile. - Top speed was 70 MPH which felt like about 120 in the low-riding carts. - There were times when I definitely felt like my life was in danger. - Despite a 45 minute orientation preparing us, I completely spun out in my very first turn because I couldn't gauge the speed. - We did have one unfortunate injury in our "main event" race which resulted in one of our interns going to the emergency room for 10 stitches to the knee. Kicked off a two-week Christmas series with a fun weekend. For two weeks, we're revealing the good and bad of Christmas time. This week, we looked at three Christmas killers: Busyness, Greed and Jealousy. Next week we'll unwrap the good side of Christmas...true meaning. Games were fun, music was great (but only 'average' because it was led by high school students which I never enjoy as much as when our jr. highers lead even though the quality is better)and students seemed to really track with the lesson. Yesterday I spent a couple of hours with Eric Iverson from Youth Works, an organization that runs short term missions trip for students. Eric and I met on an enterprise rental car shuttle van in Chicago a couple of years ago and have been trying to get together ever since. I really enjoyed our time together and feel like he's the kind of guy that, if he was smart enough to live in Southern California, I would enjoy being around more often. I was excited to talk to him because I've been wrestling with the whole idea of short term missions for quite a while and posted about it here several months ago. A big piece of Eric's role at youth works is to help them re-shape the age-old formula of traditional short term mission projects which is basically: Middle class suburban youth group pulls into neglected community and paints, re-builds, etc. then loads vans and goes home feeling good about what they just did for the kingdom. His vision is that Youth Works would begin to 'work themselves out of ministry' by helping students understand a more holistic picture of society, culture, justice etc. in the hopes that students and youth groups will begin to think about how to be part of the bigger solutions on the front end. If, instead of cleaning up a neglected neighborhood, youth groups began to think about how the church can be part of preventing the neglect in the first place. Of course, He articulated it much better than that. It seems like youth leaders find themselves in a bit of a catch-22. By simply showing up in vans we only provide band-aids and may, in some cases, actually be pro-longing the problems we think we're fixing. But, band-aids aren't bad and if applying a band-aid exposes our kids to the gaping wounds of others perhaps they'll be motivated to be part of the bigger solution. Instead of 'either, or' I think this is a perfect opportunity for organizations like youth works to help create a 'both, and' approach. I'm glad people like Eric are wrestling through it. - Flexibility: We've never had our own space so we've always been super flexible. We get bumped, double-booked in rooms, etc. A couple years ago, our junior high ministry met for an entire Summer in our parking lot with a portable stage! - Sense of Gratitude: Because we haven't had a lot of 'stuff' historically, I fear the building could begin to usher in a sense of entitlement; that we somehow always deserve the best. Right now we're thankful when the facilities team remembers to help re-set the chairs after the women's bible study! - Creativity: Having a world-class facility sets the stage for laziness. Why think outside the box when we have the world's coolest box right here? - Generosity: We've been super generous with the resources we've been given in the past. I hope we'll view the new Student Zone as an opportunity to be more generous than ever. Human nature tends to want to horde nice stuff. - Just picked up the book, 'Trust' and am looking forward to it. It's not a new book, but the title caught my attention. - I really hope the Patriots don't go undefeated...how awesome would it be if the Dolphins were the ones to beat 'em! - Have you heard of Stuck In The Middle? Check it out...neat ministry for middle schoolers. - Group Publishing has turned some of the columns I've written for GROUP Magazine into a junior high ministry book due out in February. The best part is that Scott Rubin, the jr. high guy at Willow and a great friend, added his commentary to every page. - My office has very little storage space and a whole lot of stuff that needs to be stored...not a good combination right now! - Been spending a lot of time playing Tiger Woods '08 on Xbox after the family is in bed. My computer golf game is no better than my real golf game. - Saved and saved and saved and saved, and just bought a 2005 Honda TRX 250 for my wife and daughter to share. It looks exactly like this one. On Wed-Fri of last week, our church hosted the 3rd Global Summit on Aids and the Church. On Saturday we hosted our first Youth Aids Summit. We were expecting about 300 students and had almost 1,000 show up. One of the highlights was World Vision's Step Into Africa that allowed students a 20 minute journey into the life of a child affected by HIV/Aids. To wrap up the weekend, we dedicated our junior high services to the topic of compassion.